This unique house has hand-laid river rock exterior, is located on a 1 acre lot adjacent to the North Fork River, and its 2nd floor balconies offer exceptional views of North Mountain. 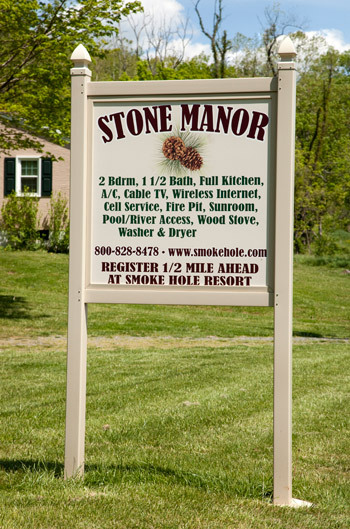 The Stone Manor sleeps up to 4 with 2 bedrooms on 2nd floor with one queen-sized bed in each bedroom, the master bedroom has a 1/2 bath. The first floor has fully equipped kitchen, living room with cable tv, full bathroom, washer & dryer and screened in sunroom.